These limited edition reproductions are now available! Wilmington artist W. James McGlynn is well known for his watercolor paintings of historic buildings, landscapes and gardens. McGlynn was commissioned to capture the scenic Christina Riverfront in his signature style. 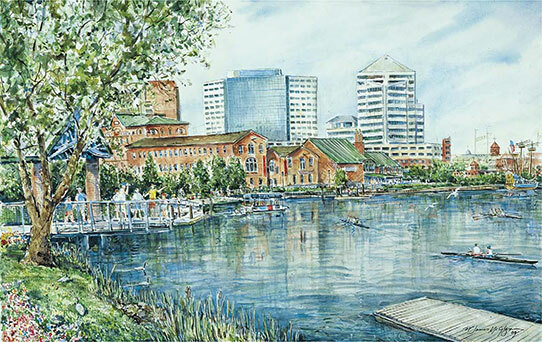 This painting depicts a bend in the river with views of new construction and renovated historic buildings as well as wild- life, plants and activity on the water, which reflects a cerulean blue sky. Rowers, a river taxi, and the Kalmar Nyckel tall ship are featured. Limited edition reproductions are now available! Printed in permanent pigments on 19” x 22” acid-free paper, this art print will bring a lifetime of enjoyment… it’s a perfect gift! Price is $82.95. Process payment here or call the Riverfront Development Corporation at (302) 425-4890. In 1995, a Governor's task force created the Riverfront Development Corporation of Delaware (RDC) to oversee the futures of the Brandywine and Christina Rivers. Read More! Riverfront Wilmington © 2015 All rights reserved.